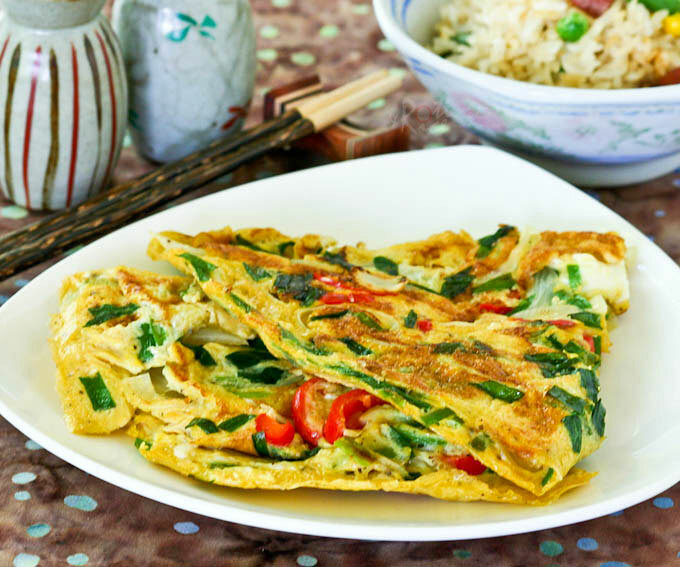 This quick and easy Asian style Omelet with Chives and Onions can be thrown together in minutes. It is usually served as a side dish with rice. Eggs are a good and inexpensive source of protein. They are eaten throughout the day in many parts of Asia. For breakfast, they are commonly added to rice or noodles. They can also be prepared as a side dish for lunch or dinner, usually served with rice. 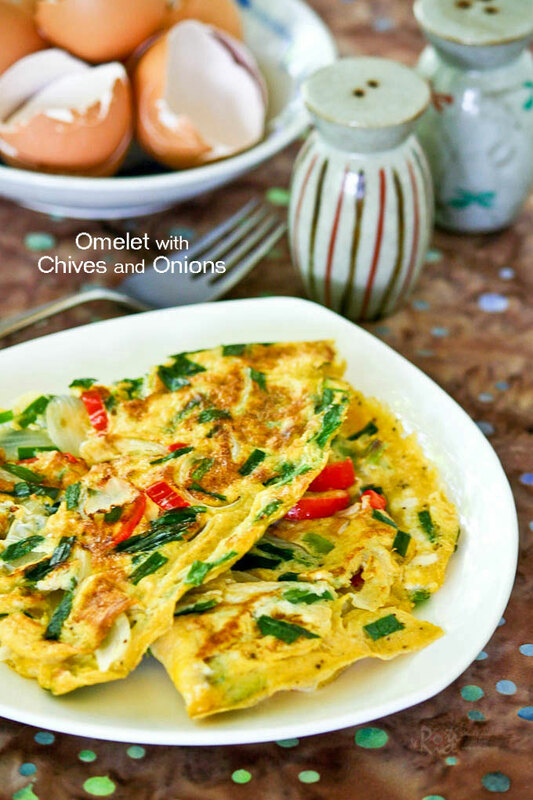 This Omelet with Chives and Onions is a popular side dish where I grew up. It is usually thrown together as a last minute “filler” dish when it appears that the planned dishes served with rice are insufficient. Any kind of meats or vegetables may be added. Chives, onions, and chilies are popular choices. This dish has been around as far back as I can remember. 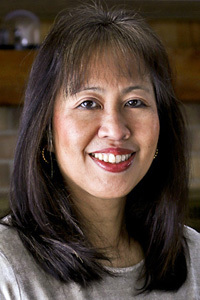 A little shrimp, oysters, or thinly sliced Chinese sausages may be added for greater flavor. At one point there was even a deluxe hot-plate version with flowering chives served at restaurants. It was really tasty. To see what Chinese chives look like, please click on this Quinoa Chives Fish Cakes post. They are usually sold in bunches and one bunch goes a long way. I made four separate dishes with the bunch I bought. Crack eggs into a medium sized bowl. Add soy sauce and pepper. Whisk with a fork until well combined. In a medium sized non-stick pan, heat oil. Add onions and chili. Fry until fragrant, about 2 minutes. Add Chinese chives and fry for another minute or so. Reduce heat to medium. Pour in eggs to cover base of pan. Allow eggs to cook and set for about 2 minutes. Fold omelet in half using a spatula. Cut folded omelet in half with edge of spatula. Flip omelet over and allow it to cook and brown for another 2 minutes. Often times the simplest recipes are the ones that are most well used and loved. 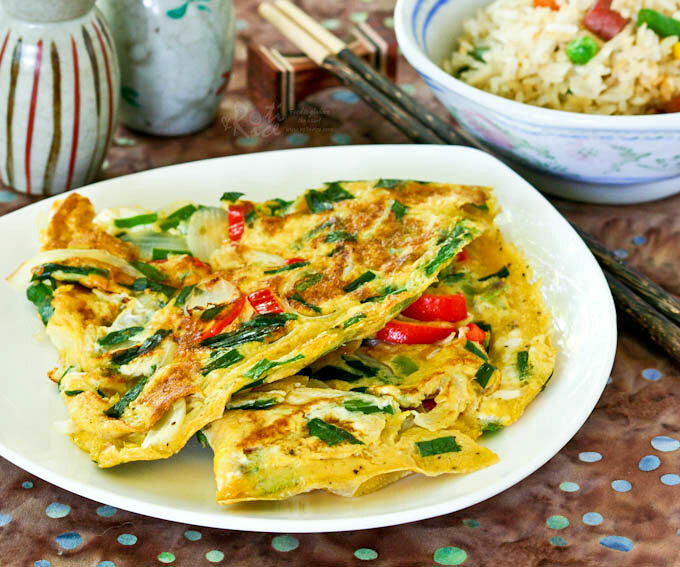 This Omelet with Chives and Onions is a very homey kind of dish which I cook whenever I have some Chinese chives on hand. It is highly customizable. Add your favorite ingredients and make it your own. Would be great to serve some plain congee for the dinner! Sounds delicious! Some plain rice or congee would be fabulous with this. YUM!!! Perfect flavored and looking omelet!! This looks like the perfect Saturday brunch!